We’d love your help. Let us know what’s wrong with this preview of 1939 by Chuck F. Adams. To ask other readers questions about 1939, please sign up. This book is a must-read for any classic movie fan. I thought I already knew a lot about some of these films, but I learned much more from this book. I especially enjoyed the emphasis on the literary works on which these films were based. Lots of read-out-loud stuff to share with anyone who happens to walk through the room. Right from the "Author's Note" at the book's beginning I was hooked. "When I was twelve years old, going to the movies was a Saturday afternoon ritual that my friends and I observed with an almost religious fervor." He not only tells about the making of the films but the making of the books as well. Wow -- special features in a book! I learned about the authors, the book's (or story's) journey to publication, t Lots of read-out-loud stuff to share with anyone who happens to walk through the room. Right from the "Author's Note" at the book's beginning I was hooked. "When I was twelve years old, going to the movies was a Saturday afternoon ritual that my friends and I observed with an almost religious fervor." He not only tells about the making of the films but the making of the books as well. Wow -- special features in a book! I learned about the authors, the book's (or story's) journey to publication, the directors, the studios, the stars, the casting, the shooting, the editing, the premiers, and even "the rest of the story" about the stars and so forth. Yep, it's a trivia smorgasbord. Lots of b&w photos, too. Did you know that GWTW (Gone With the Wind) cost nearly $4million -- the most expensive film made up to that date -- but it brought in nearly 3x's that amount in its 3-year-long first run and over $40,000,000 to date? 2014 marked the 75th anniversary of 6 of the best movies produced in Hollywood: Gone with the Wind, Stagecoach, Mr Smith Goes to Washington, Hound of the Baskervilles, Huck Finn and The Wizard of Oz. This gives a brief biography of each film, from the writing of the original stories and novels that inspired each to the making of the film and what the stars went on to do after. One actor was in three of those! Not all the information was new, and I'm only really familiar with half of them, but it 2014 marked the 75th anniversary of 6 of the best movies produced in Hollywood: Gone with the Wind, Stagecoach, Mr Smith Goes to Washington, Hound of the Baskervilles, Huck Finn and The Wizard of Oz. This gives a brief biography of each film, from the writing of the original stories and novels that inspired each to the making of the film and what the stars went on to do after. One actor was in three of those! Not all the information was new, and I'm only really familiar with half of them, but it was interesting - and absolutely an incredible year. Fun facts: Everyone who read GWTW could only see Clark Gable in the role, many going so far as to call him Rhett even in the years between it coming out and casting. And he hated the book and had to be bribed into taking the role. Edgar Allen Poe created the word detective and was a major inspiration for Sir Arthur Conan Doyle. Introduction is weak. The back stories of the great films does deliver. It moves fast. Typefont makes one feel like they are reading a newspaper and hence lack the credibility feel of a serious book about this most amazing year in Hollywood cinema history. Fun look at behind the scenes making of 6 great films. 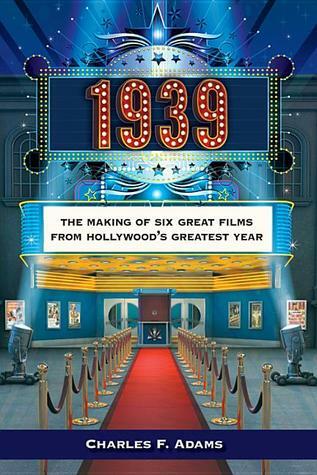 1939 was an exceptional year for films. If anything, the author could have featured more films from that year. very cool, I had no idea about some of the history of these movies and some are my all-time faves! I would love to read another book just like this - either about other films out this year (this only features 4 of the 10 films nominated for Best Picture) or about films for any other year.